DETROIT, Mich. — Culminating the athletic department’s first year in the Wolverine-Hoosier Athletic Conference (WHAC), Director of Athletics & Wellness, Dave Sichterman, organized an awards reception that celebrated the many accomplishments of the fine student-athletes of Marygrove College over the course of the 2012-13 season. The awards reception, entitled The Mane Event, was also a great way for the department to send off the 2009 incoming class in style â a group that helped start most of Marygrove’s fall sports. In total, The Mane Event was host to over 100 student-athletes and guests high atop the Amnesia Room at Motor City Casino Hotel. The student-athletes, staff, and guests were treated to a night that celebrated the best-of-the-best with a birds-eye view of Detroit’s beautiful night skyline. A team effort, the athletic department relied on coaches and staff members to help select the nominees and winners of each category. Of those, Matt Johnson, Academic Coordinator and Men’s Soccer Head Coach, Tim Johnston, Assistant Athletic Director for Media Relations & Events, and William Pugh, Assistant Athletic Director for Sports Medicine & Wellness, helped Sichterman drive the event’s success behind strong collaboration. 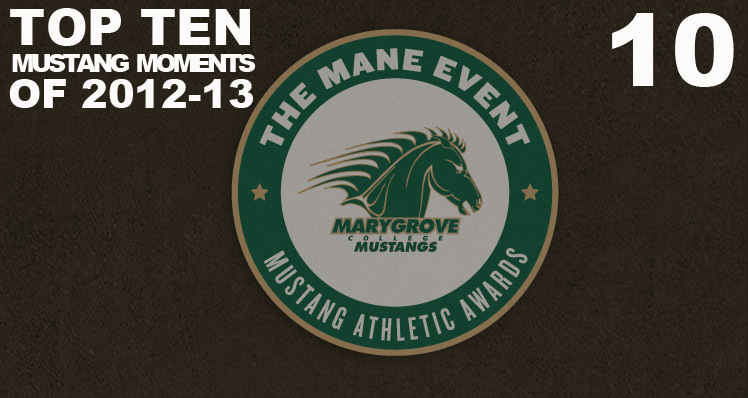 See below for complete list of nominees and winners from The Mane Event. Nominees: Keara Marks layup to break the women’s basketball all-time scoring mark at Marygrove. Jordan Berry’s OT goal at Indiana Tech to push the Mustangs to the WHAC semis. Deanna Lints save to preserve the win vs. LTU for first WHAC win. Manny Washington’s thunderous lob dunk courtesy of Justin Armstrong at Western Michigan University. Nominees: Kiara Cobbs 21-kill (record) night vs. Grace Bible College. Jordan Berry: scored both goals in the OT playoff win @ Indiana Tech. George Jackson’s double all-conference day in the 600m & 800m at the WHAC Indoor Track & Field Championships. Keara Marks’ 35-point Montana effort during the Thanksgiving trip (career-high). Congratulations to all of our student-athletes for a great 2012-13 campaign! All of our teams worked hard this year! We look forward to another successful year in 2013-14!